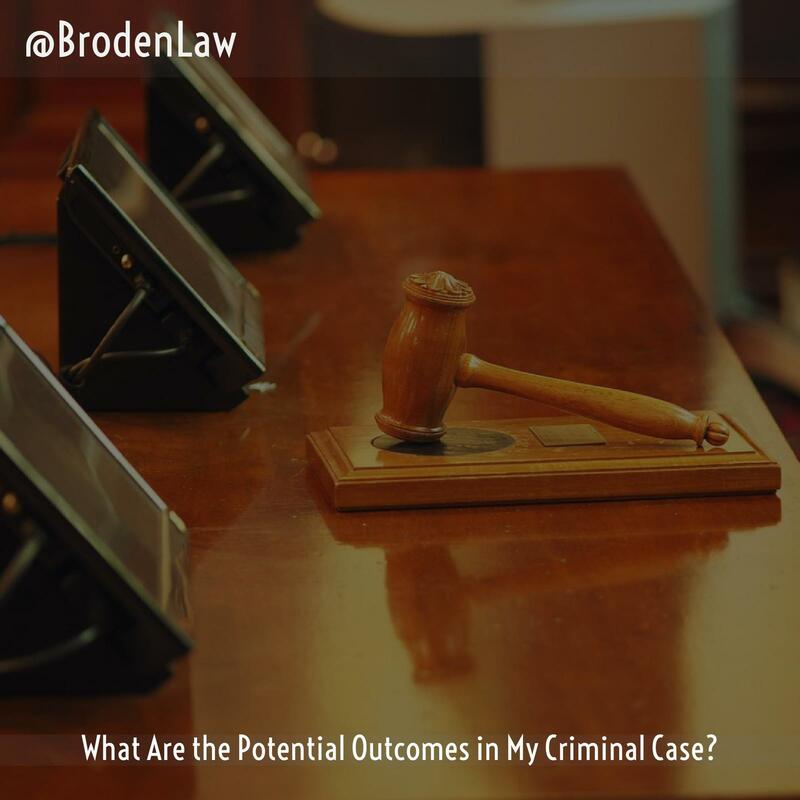 What Are The Potential Outcomes In My Criminal Case? No matter what kind of case you’re facing, being charged with a crime is a scary experience. It’s normal to have a lot of questions, and to worry about the possible outcomes in your case. Will this affect your career? Will you have to worry about a permanent criminal record? How you will tell your family and neighbors? This is why it’s important to work with an experienced criminal defense lawyer. Although no one can truly predict how a case will turn out, there are definite possible outcomes, and it’s important to be aware of them. A knowledgeable lawyer who has handled multiple cases like yours will be able to give you a good assessment of the likely outcomes in your particular case. If the Charges Are Dropped – It’s possible that the prosecutor will choose not to pursue a case against you. However, the arrest may remain on your record. If You Plead Guilty – Talk to a lawyer before you decide to admit guilt. Although many prosecutors may try to bargain with you by offering reduced charges in exchange for a guilty plea, there are real consequences to an admission of guilt. Always discuss this decision with your lawyer. If You Take a Plea Bargain – In many cases, prosecutors strike a deal with defendants by extending the chance to take a plea bargain. In most cases, you must waive your right to a trial if you decide to accept a plea bargain. According to a New York Times report, about 97 percent of federal cases and 94 percent of state cases end in a plea bargain. If You Are Found Guilty – If you proceed with a trial, the judge or the jury must listen to both sides of the case and determine if you’re guilty or innocent. If you’re found guilty, you have an opportunity to appeal your case. However, just because you appeal does not mean your appeal will get accepted for a hearing. Furthermore, being found guilty means you could face prison time, a fine, probation, or a combination of consequences. If You Are Found Not Guilty – Similarly, being found not guilty means the judge or the jury decides you are innocent of the charge brought against you. If the Court Declares a Mistrial – In a mistrial situation, the prosecutor or the defense must ask the court to declare that an error has occurred and that the case can’t go forward. In some cases, a mistrial happens because the jury is deadlocked and can’t agree on a verdict. In other cases, mistrials occur due to a mistake during the case, such as a juror acting inappropriately. In these instances, the prosecution can typically ask for a new trial with a new jury, starting the whole process over again.